As horses age, some of their systems begin to function less efficiently. When this happens in the digestive system, weight loss can result. From a decreased ability to chew because of poor teeth to a decline in the breakdown and absorption of proteins, and from a decreased ability to ferment fiber for energy and calories to a decline in the production of B vitamins, there can be a number of reasons why an older horse may be losing weight. 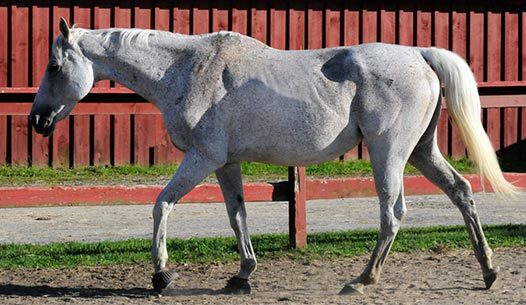 It’s important to pay close attention to older horses especially, because changes (like weight loss) can happen rapidly. When a horse begins to have trouble maintaining weight, it’s important to have a veterinarian perform a complete physical examination on the horse, to make sure there are no underlying medical reasons for this problem. For example, Cushing’s Disease, a dysfunction of the pituitary gland, can rob a horse of his muscle--especially the topline and bottomline. In addition, older horses with Cushing’s may not be able to handle sugars and starches as well anymore so forage, grain, and other feedstuffs must be carefully selected. Although fresh grass seems like the most natural diet for horses, it may no longer be the ideal source of roughage for the older horse needing to put weight on. Not only can it be difficult to bite off and chew, it can be high in sugars and starches. Better options for senior horse weight management include high-quality grass hay with soft stems, soaked hay cubes, or the newer chopped hays in a bag that are fortified with vitamins and minerals. Muscle supplements to provide essential amino acids for muscle support and fat supplements to provide calories are additional senior horse weight gain strategies. And don’t forget antioxidants like Vitamin E and Vitamin C! Ask the Vet: Is Your Senior Getting Leaner?